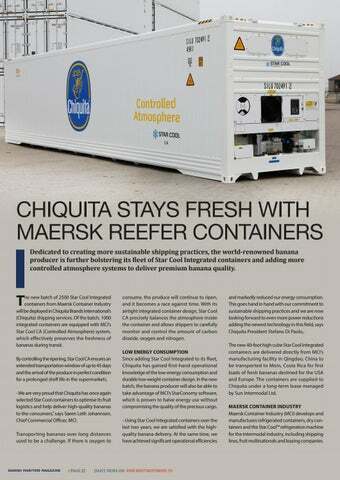 CHIQUITA STAYS FRESH WITH MAERSK REEFER CONTAINERS Dedicated to creating more sustainable shipping practices, the world-renowned banana producer is further bolstering its fleet of Star Cool Integrated containers and adding more controlled atmosphere systems to deliver premium banana quality. and markedly reduced our energy consumption. This goes hand in hand with our commitment to sustainable shipping practices and we are now looking forward to even more power reductions adding the newest technology in this field, says Chiquita President Stefano Di Paolo,. The new 40-foot high cube Star Cool Integrated containers are delivered directly from MCI’s manufacturing facility in Qingdao, China to be transported to Moin, Costa Rica for first loads of fresh bananas destined for the USA and Europe. The containers are supplied to Chiquita under a long-term lease managed by Sun Intermodal Ltd. MAERSK CONTAINER INDUSTRY Maersk Container Industry (MCI) develops and manufactures refrigerated containers, dry containers and the Star Cool™ refrigeration machine for the intermodal industry, including shipping lines, fruit multinationals and leasing companies.